Make a simple pin gage from the back end of a drill bit. the go pin is sized to just enter an LPP pocket and it wont enter an SPP. A nice wood handle on the end and leave the pin bout an inch long. A piece of 3/8" or 1/2" slightly tapered with radius on each end is comfortable to hold. Drill the center hole for the pin and form handle then glue pin in handle. A nice oil finish. Just recently cleaned out an old PD armory storage room.. Got a little over 2000 cases of 38 and 357 that had large primers.. The brass had been there for years.. Fred said it best about the 38 L/P brass, we both were loading back in the 60's and when the change over to small primer came along it was a pain for awhile sorting the small from the large.. Actually sold the large primer 38 & 357 to guy thought it was neat.. Also got a couple boxes of NyClad 38 ammo in the clean-out. Waiting for JMORRIS to chime in I believe he fabricated a sorter. Their eyes are way better than ours. Reject rate <1%, and you get a great bonus on interaction. Their attention span is no more than 30 minutes. So is mine. Sort a pile, wash up, eat ice cream. All are happy. PS Don't worry about those rolling around the place. If you step on one, the smile that put it there is bigger than your snarling. I sort them while I'm picking them up off the ground. Large primer go in the bag, small primer go over the berm... and back to hell where you came from!!! When I go to a range used by others, I have a hard time leaving brass on the ground. 9mm & 45 ACP brass comes home with me whether it was from my gun or not. The rimmed revolver stuff is almost always mine, although I do pick up some strays occasionally. You are dang skippy, amigo! 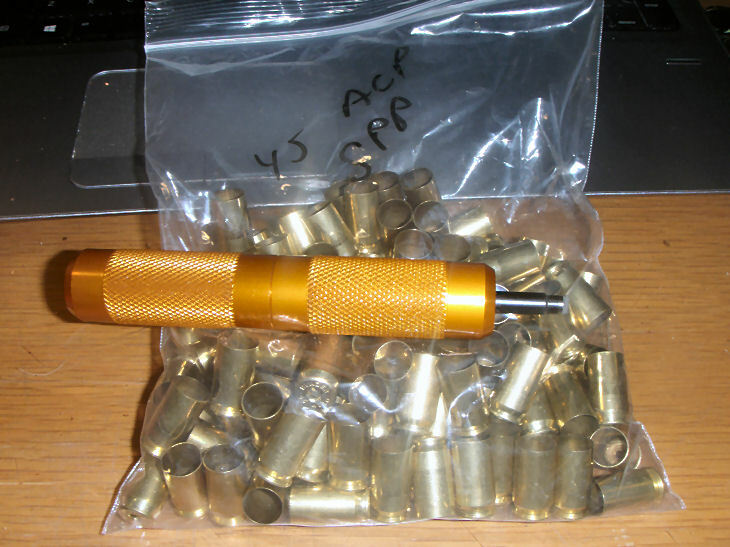 I always figured that a mole from the anti gun crowd introduced small primer 45 acp brass just to annoy us. I built two different methods. This one I suppose would be the fastest because they are sorted out as I load. No “extra” time involved. This is the other machine, fed with a collator, deprimes then sorts by pocket diameter. Low tech. Large pocket reamer. If it fits goes in a bucket. If it don't it goes inna bag. I find way more LPP. You can sort while watching TV. If small primer pockets are such a good idea, brass manufactures should have discontinued making large primer pocket cases. In 4-5 years the switch would been realised. I use a double sided Lee pocket primer cleaning tool in a Makita right angle a low RPM. I decap the brass then run it thru the large end. If you get a small pocket you know right away. I can do about 400 pieces in a half hour. The benefit is you get clean primer pockets and that's not a bad thing! Even if they stopped making small primer pocket 45. acp we will still have to check for ever. I traded a small quantity of 40 S&W cases for a very large amount of small primer 45acp some time ago. 45acp was the only caliber with large primer I load on the 650xl. until these run out I don't have to change out the primer setup and I'm leaving them laying on the range for the next guy. Other than that they are nothing but pure evil put on this earth by the devil himself to torment my eyes. Not having to change out the primer setup is handy for loading .45, 40 & 9 mm. After I started dealing with .45 small primer brass I developed a habit of looking at the head stamp on each piece of brass before placing in the 550 shell holder. When loading 9 mm I have caught .380, 38 super & 9 mm mak before putting them in the 550. I grab a handful at a time and just look at the primer size. I’ve found it much easier to spot the small primers when looking at a batch of 10-15 cases at the same time. It’s also much quicker to do a dozen at a time. I throw all the SPP’s into a bucket to be used at a later date. I save all the SP & junk brass I run across.....scrap dealer near me will buy brass or trade 2lb lead for 1lb brass. WIN! An old Cherokee was teaching his grandson about life. "Inside me two wolves fight," he told the boy. "One is evil - he is anger, envy, greed, arrogance, self-pity, resentment, lies, false pride, and ego. The other is good - he is joy, love, hope, serenity, humility, kindness, generosity, truth and faith. The same fight is inside you - and every other person, too." The grandson thought for a minute and asked,"Which wolf will win?"